You are not logged in. [Log In] Forums Flight Sim Controllers VKB T-Rudder "toe brakes" emulation. 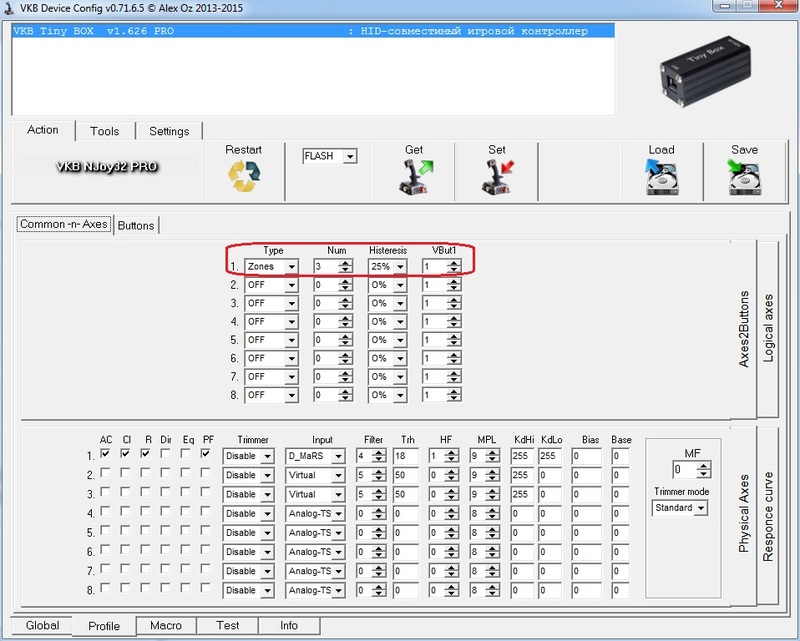 #4176480 - 10/02/15 02:41 PM VKB T-Rudder "toe brakes" emulation. Since VKB T-Rudder don't come with "toe brakes" - I think this construction and vertical movement prevents implement brakes - a workaround is set the rudder axis to press buttons and use this buttons for brake in games, e.g. CloD Luftwaffe planes, DCS WW II planes and some jet's. 2 - Run the program and in "settings" tick the "Expert mode", restart and select the T-Rudder controller: VKB Tiny Box to load configuration options. 3- In the tab "Action" tick the "A2B" and in "#but" set 3. 5- Click on Set (joystick icon) to save the configuration in Tiny BoX EEPROM. Now in game you can set the buttons 1 and 3 for left and right wheel brakes. Button 2 do nothing. In DCS/CloD is easy to set, select the function "Left wheel brake" and push the rudder to left to active the button 1 and holding* in this position, press the OK(APPLY) button. Same for right. *If you center the rudder before hit OK/APPLY the button 2 will be activated, in DCS the last button is registered, in CLoD is registered both. In Clod assign the right brake is a bit trick, most of time buttons 1 and 2 are registered (since CLoD allow any button as modifier for other button), ease solution, leave in this way and edit the ConfUser.ini removing the Joystick # +Key1 reference. Joystick1+Key2=wheelbrake[B]r[/B]tx (the joystick number (1 in case) varies depend on how many controllers is used). For CloD, the joystick (in Windows Control Panel > Games Controllers) button number 1 is 0, 2 is 1 and 3 is 2. So leave assigned in User.ini Key0 and Key2 for left and right brakes. If need brake both wheels use the button/key already assigned for this, for British/Italian planes. In DCS I "complicated" the things a bit, since my joystick has a picky button, I set this button as modifier and add this to left/right wheel brakes. So the brakes will only activate if this button is pressed, eg. in taxi maneuvers, but in take-of run after the tail get lift the rudder pedal control only the.. rudder. Press a button/key for brake both wheels and move the rudder to brake more/only left of right. Why this "historic" deviation? Since they target market is the "new players", usually with "3in1" joystick with twist rudder and no "toe brakes", this make all sense. But if want use buttons instead axis in this game, set in the same way. Probable will be need edit the "current.map" and "current.actions" like the ConfUser.ini in CloD, since key assignments in this game is a bit trick too. Despite the lack of "toe brakes", if one want a rudder pedal better than the "plastered" Saiteks and the "electronics obsolete" CH, VKB T-Rudder is a nice option, more affordable than "high tech" MFG Crosswind and Slaw Pedals. In Stratojet (VKB retailer in USA) is said that VKB are working in "virtual toe brakes". Probable they will add in the software ability to rudder axis emulate 2 virtual axis for brakes use, in proportional way. VKB: "We are developing a more advanced algorithm to control the mixing axes separate wheel brakes." There is show the T-rudder possible adjusts, like the CAM two positions and spring two adjust. Last edited by Sokol1; 10/07/15 03:13 PM. With virtual axis for brakes. Sokol1,is this the software VKB was working on to allow brake use with the T-rudders? 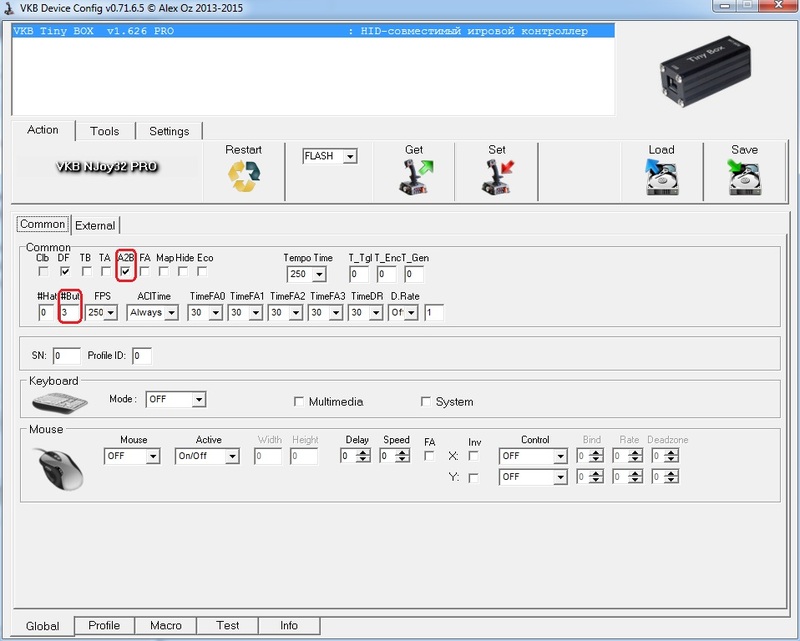 VKB Device Config software is used only for create and save (Set) configuration profiles in Njoy32 controller EEPROM. Is not need leave running in background (like Manager, SST, TARGET) to use this configurations. I have just bought these , well made , I am going to try this , is there a way to apply a percentage , where I can press down to apply the breaks at fully pressed down , at the moment if I just touch or press down the left or right pedals start to break , any ideas . I think this is what is done with virtual axis instead buttons, but I find the brake response slow with the actual virtual axis settings. For the purpose of toe brakes, help in taxi maneuvers, the brakes on button in DCS work well. VKB say in Russian forum that this week will test a new algorithm for this "virtual toe brakes". BTW - If you go test some these configs always save the actual configuration first - use GET and SAVE buttons. VKB Config Soft is powerful but extremely complicated. Stratojet say in BoS forum that VKB will release a simplified version of this soft, more friendly for use. Hey thanks for the quick reply , Yes ive applied buttons to left and right toe breaks , button1 and button3 , just takes a bit getting used too ,but it sure does work really pleased , its tricky taking off in DCS 109 and 190 . but works .looking forward to the new software . Don't use brakes to control DCS Bf 109 K-4, Fw 190 D-9 take-off run, just the rudder - and don't firewall the throttle. Available - in Beta - the software T-Link for VKB T-Rudder. - Allow set a joystick button for emulate 2 virtual axis, Y and Z, for brake right and left wheel simultaneous, this brake application is progressive but "aggressive". Moving the rudder, e.g for right the braking force is cancelled in left wheel wheel and vice versa. In practice work like the British/Italian/Russian "differential brake" system, press the "bicycle brake" on stick and move the rudder. Contrary to advertsing, this software don't create "virtual toe brakes" for planes with this brake system (P-51, Bf 109...) but create "virtual differential brakes" (British/Russian system) for this planes. - Allow apply momentary a different response curve in rudder axis (optional feature), by pressing a joystick button, e.g. reduce axis response during aim. - Allow update the T-Rudder firmware. The software need be on during game for this functions work. Tested for planes with "toe brakes", CLoD Bf-109 and DCSW TDF51D, work well for basic taxi, as brake button used joy' trigger. For IL-2 BoS this is not needed, the "differential brake system" (Russian) is available for all planes in this game including Luftwaffe ones and P-40 - so use a external software to do the same thing is not necessary. Including in game the braking force is proportional to rudder movement, e.g. move rudder 70% for right, 70% of brake in right wheel, 30% in left wheel, with T-Link is all or nothing. Last edited by Sokol1; 03/11/16 05:28 PM. VKB announce that T-link v_0.66.1 compatible with T-Rudder Mk. IV Black Box is available - require update Black Box firmware for v_1.81.6. After setting the brake button in the T-Link, restart the program. I test this T-link version with T-Rudder Mk.III and work OK. User inform that works with his Mk. IV & Black Box. BTW - T-Link give "Bicycle Lever Differential Brakes" or "British/Russian Brakes", not "Tip-Toe-Brakes", the rudder bar movement don't press the brakes, just determine what wheel (right/left) will be braked when pressed the assigned joy/throttle button in T-Link. In picture, rudder (X) slight for left, joy/throttle button assigned for Brakes in T-Link is pressed, virtual Z axis brake is pressed (left wheel braked). If you assign joy/throttle button for ACCU in T-link (optional), pressing and holding this button will reduce the rudder authority (similar to dual rate in R/C transmitter), can be useful for use rudder during aim. FYI - IL-2:BoSBoM don't need use T-link for brakes, "Bicycle Lever Differential Brakes" is available for all planes (from iL-2 to BNf 109), together with each planes original (IRL) brake system (e.g. in game Bf 109 can use "Bicycle Lever Differential Brakes" and "Tip Toe Brakes", iL-2 can use "Bicycle Differential Brakes, IRL this plane don't use "Tip Toe Brakes").